An implantable system for drug delivery provides a new strategy for drug therapy, and typically involves a microfluidic chip produced with micro or nano-technology. Implantable systems have the flexibility to conform various schemes of drug release, including zero order, pulsatile, and on demand dosing, as opposed to a standard sustained release profile. Such an implantable system is classified as allowing either controllable or uncontrollable drug release after implantation, so an active or passive delivery system respectively. The performance and related applications of these systems vary. The key points of each technology are highlighted such as performance, working principle, fabrication methods, and dimensional constrains. We here review the implantable drug-delivery system in current research with a focus on application and chip performance, and comparison for passive and active delivery system. 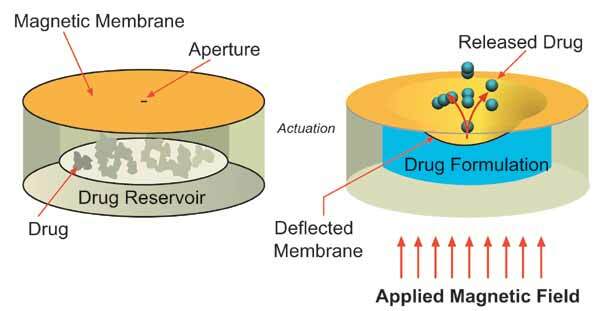 Drug delivery, Implant, MEMS, Microfluidic. Department of Mechanical Engineering, National Chiao Tung University, Taiwan.